We all have that one trick (or in my case many tricks using different props) that we would love to achieve but it always seems just outwith our grasp. This article is an attempt to help you to gain the best mindset and techniques to conquer the trick. I use the example of a Juggling Trick, but this advice should help you with whatever prop and trick you wish to conquer. 1) Frame of Mind Be in the right frame of mind before you start trying to learn this difficult trick. If you are not fully able to concentrate on it, and if you are in the sort of mood where every failure to achieve the trick results in you becoming very annoyed at yourself, then today is not the day to be attempting this difficult trick! 2) Motivation What is your motivation for learning this trick? Sometimes if you know why you want to learn the trick, then it will give you a bit more perseverance to continue working on it. If you have no particular reason at all, and only ever attempt the trick at random times for just a few minutes, then you may not achieve the trick as you aren’t prepared to put in the required amount of practice required. 3) Visualisation Do you have a picture in your mind of how the trick should look? Have you watched it many times on video, seen it from different angles, broken it down step-by-step? It will help if you know exactly what you wish to achieve, otherwise how will you know when you have achieved it! Have a very clear picture of the end goal, and every once in a while, stop practicing, close your eyes and visualise the pattern again, so it becomes a lot clearer amidst all the dropping! Timing – throwing one ball too fast which makes the whole pattern out of sync. Movement – do you have to move your arm a bit further to the side to make a certain catch, which then means your pattern begins to get wider and wider? Environment – Perhaps you are practicing the trick in an environment that doesn’t give you a good chance of achieving it. Examples would include practicing outdoors on a windy day, or indoors with a low ceiling. Give yourself the best chance of achieving the trick, and then you can practice in these locations to improve the trick and make sure it will work for wherever you may want to display this new skill! Once the prop is already in the air, you are reacting to the throw. If it went too high or too wide, then the part of the trick that you need to correct is the moment of release, rather than trying to make sure you can continue with the wrongly thrown object. In other words, focus on the root of the problem. 5) Posture Sometimes all it takes is checking that your body is in the best position. If you are able to look into a full length mirror (practicing in a dance class where they have full length mirrors along a wall is a bonus) before beginning the trick, then take a look at yourself. Do you look way too tense? Have you suddenly dropped one foot slightly behind the other? Are you feeling yourself starting to hold your breath instead of breathing normally? Correct yourself, take a deep breath and give it your best shot! 6) Strength / Fitness If you cannot keep a run of the trick (eg 50 throws) going, then could this be because you need to build up your strength, stamina and/or fitness levels? Did you bother to warm-up before beginning your practice session (this can make a huge difference, especially in not feeling completely wrecked the next morning so you can have another practice session)! Juggling is a very physical exercise, especially the repeated picking up of fallen props over the course of a practice session! 7) Relax your Mind Are you thinking too much about the pattern? Sometimes you need to just go for it, and not be holding onto the prop willing yourself to begin throwing them up in the air, or beginning a countdown to starting the trick. You will certainly fit in more attempts if you can get yourself into a “go for it” mentality, and not be facing the trick with any fear or trepidation! 8) Working Under the Pattern Are there other tricks you can learn which will help you to gain the correct skills for achieving this trick? For example, if you were struggling with 5 ball juggling, then there are a whole series of 3 and 4 ball tricks that you should master first of all which will help you with your timing, speed and accuracy. This is referred to as “working under the pattern” as you are building up to the full pattern step-by-step rather than just going for it! By attempting other tricks, it reduces the chance of ending up with any repetitive strain injury, and also broadens the number of other tricks in your repertoire! 9) Use a different prop Could you learn this trick with a different prop? If you are trying to master a pattern using clubs, could you try learning it first of all with balls and/or rings? This could get you used to the correct timing, as well as give you the confidence at knowing that you have achieved this trick with another prop. 10) Correct? Are you sure that you are learning the trick correctly? If the trick is still eluding you after all of the above, then I would suggest that it is worthwhile posting a request on a Juggling forum, or asking friends who can do the trick for some advice. Sometimes, you may have added an extra move that isn’t required, or you may have missed a part of the trick out completely. You may actually be attempting to do a trick that is completely impossible, and no amount of attempts will achieve such a thing! 11) Work above the pattern Work above the Pattern – sometimes it can be good to try an even more difficult trick. If you are learning 5 ball juggling, then try some 7 ball juggling during each practice session. You aren’t expecting to be able to achieve this ultra-difficult trick, but you may suddenly find on your return to the 5 ball trick, that the pattern now seems slower and feels much more achievable! Congratulations – you can trick your brain into making a fast pattern seem much slower! 12) Sleep on it! If you are getting nowhere with the trick after a practice session, don’t be disheartened! You are putting in the hours towards becoming successful with this trick, and maybe all you need is a decent length of break and you will conquer it at your very next practice session! 13) Out of Context I remember a story from several years ago of how the juggler Luke Burrage managed to finally achieve his hard trick – an 11 ball flash. It was when he had crashed his Camper Van and was waiting on the recovery vehicle arriving. It wasn’t a planned practice session, but the adrenaline was high and for some reason the trick just worked! If you can carry your props around with you all the time, then it can be worth occasionally just trying the trick in a place and at a time you have never tried it before. The final note is to ask you to be inspired and believe in yourself. 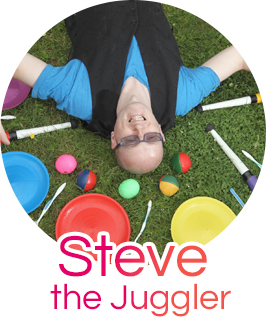 If we go back just 20yrs, there were only a handful of 5 ball jugglers in the UK (if indeed that many). It’s only in recent times with the ability to be inspired by video clips from all over the world of people breaking Juggling World Records, that the boundaries of what is possible has became much wider. The same thing is currently happening in the world of the diabolo where it is only around the time that the Diabology DVD was released, that a world of opportunities became available, and now there are currently at least 2 people in the UK who can keep 4 diabolo’s going at the same time! They are currently inspiring many others to do the same, so this number will continue to grow! There will always be the next “difficult trick”, but if someone else can do it, then why can’t you!